In front of an imperial cart (gosho-guruma), the onnagata Yamashita Kinsaku, identified by his gentian blossom mon (crest), is playing a shakuhachi (bamboo flute), which is usually played by itinerant Buddhist monks (komusō). 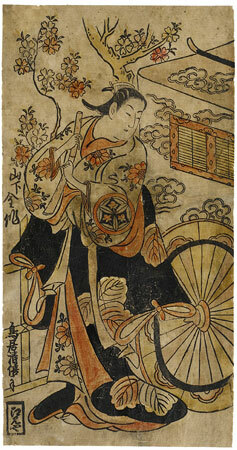 Over his kimono, which is decorated with chrysanthemums, he is wearing a black cloak with large kaji (mulberry) leaves. Yamashita, Kinsaku is standing in front of a court carriage (gosho- guruma) with a shakuhachi (see below). Over a robe decorated with chrysanthemums he wears another, a black robe with large kaji leaves (mulberry), which he has let down to his waist. In the background a cherry tree is in bloom. Yamashita, Kinsaku was an onnagata (female impersonator), from Ôsaka. He performed during two periods of his career in Edo, in the years from 1711-1717, and from 1723-1729. He only returned against to Edo in the 1740s. Kinsaku is represented in carious roles on several woodblock prints by Kiyomasu II, always identified by his mon, the gentian flower (rindô). His corpulence distinguishes him from other onnagata illustrations by Kiyomasu II. Although the scenery of the court coach and the blossoming cherry tree points to one of the numerous court legends of the Heian Period, the scene could not be identified. It is unusual that in the leaf, Kinsaku does not play the flute, but a shakuhachi, a kind of oboe, which was not normally used in women’s roles. It is the instrument of the wandering begging monks (Komusô) who, with their heads completely hidden under high straw hats, traveled through the land.